It has come to my attention that I have been very much slacking on writing upgrade articles. This has to change! How can I write about Wave 6 when I haven't even finished up Wave 5? And I haven't even touched on the Commanders for the wave. While a friendly ship is attacking a ship at distance 1 of a friendly squadron, before rolling attack dice, the attacker may replace up to 2 dice in its attack pool with an equal number of dice of any color or colors. Sato lends himself to very specific lists to capitalize on his gimmick. For one thing, you want Red dice to turn into "better" dice at long range, and you want fighters that are not only able to get into position, but robust enough to deal with enemy fighters trying to finish them off. This lends him to high hull squadrons like YT-1300s and VCX-100s, but also faster Rebel fighters like A-Wings and Tycho. Consider Han Solo as well, with Grit, and the ability to position himself at the start of the round where you want your fire to go. 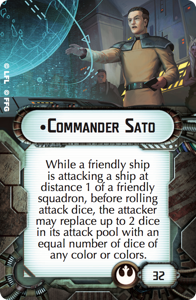 For ships, as said before, Sato loves Red dice. Salvation in particular just gets better when Sato is around, as the title lets you roll potentially 3 damage on each Black dice (hit / critical where the critical counts as 2 hits). You also get similar average damage to a Turbolaser Reroute Circuit upgraded CR90-A, without any upgrades. Even the lowly Pelta Assault-Class can have its 2 Red dice turned into potential Black critical effects. Similarly, Scout MC30c's can take advantage of long range Black dice and Ordinance Experts to deliver some fairly reliable long range critical effects. Assault Frigates are another ship that has its long range damage boosted, and can take Ordinance Experts to improve its expected damage further. Getting a double arc at long range with Paragon can let you throw a decent amount of damage downfield. Sato is not quite as good with large, point heavy ships, as that limits the amount of times you can take advantage of his ability. One thing to consider though, is that you aren't limited to the color of dice being Black, that is just the most obvious way to improve damage. Consider using a MC80 Star Cruiser or MC80 Command Cruiser with SW7s - you can turn some of your Red dice into Blues, and guarantee reliable damage not only from your main arc, but a reasonable amount at long range. Again, taking a Large ship with Sato limits the number of times a turn you can use him to boost your damage, so it may not be the most efficient use of his points. One final consideration; the GR-75 Combat Refit does have an attack die out the front. Just sayin'. Movement. Maybe the most important thing in any Armada game is being able to predict where you and your opponent will be on Turn 4, while it is still Turn 1. Jerry throws a big wrench into those plans. The ability to hard turn at Yaw 1 should not be underestimated, particularly with most Imperial ships that have "-" at higher speeds. Here is a list of all Imperial ships that have "-" at Yaw 1. Probably the ships he benefits most are the Arquitens (which have an anemic "-" at any speed above 1) and the Victory-Class Star Destroyer (which notoriously only has "I" at the final yaw at any speed). But really, he can help just about anything that isn't a low speed Raider. But this isn't his only benefit. Most Imperial ships practically demand constant Navigation commands just to be viable, and by having JJ onboard, you free those commands up for other, more important things; like Squadron commands or Engineering for your Victory, or Concentrate Fire for your Arquitens. An ISD that is able to Engineer every turn is particularly scary, and much harder to kill, as is an Interdictor. In Wave 6, this will be very useful for the Quasar to be able to concentrate fully on Squadron commands. 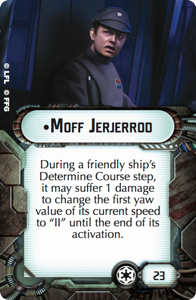 If you want to look at some funky maneuvers you can do with Moff Jerry, head on over to Cannot Get Your Ship Out, which has put together some really good picture illustrations on the subject. Hey Biggs! Just wanted to say how much I appreciate this blog. I was lost in the sea of Armada, and grasping the strategy of the game was beyond me. You helped me see things through, to understand the mechanics and in the end, to enjoy the commanding experience. You taught me to see the stewnghts and weaknesses of ships and upgrades. You're my Armada dad. Thank you. Stewnghts? Curse you chubby fingers! Sato Black dice at long range is unbelievably fun, especially with Salvation or an MC30 with OE for rerolls. Pair W/ Intel Officer and ACMs for a True pain for your opponent. Add H9 for flotillas and Foresight, and that is 103 points of pure joy (for you) / Anger (For your opponent. When I get around to picking up a Pelta, I think (to start at least) Tycho and Han are going to be auto includes in a Sato fleet for me. Dang, how much I wish the rebs had an OR slotted speed 4 ship... I think I might play a fun game where the rebels have stolen a Raider with RLBs, with Han waiting aboard and Tycho flying along side. Sato in command of course.